For all who celebrate this holiday, there is great joy in taking a step back from our outrageously busy schedules to gather with loved ones and give thanks for our myriad blessings in this life. For many, however, there is also a sense of sadness for the 46 million turkeys that lose their lives each year in the name of tradition. This was my submission this year to the 46millionturkeys exhibit at the Harlow Gallery in Hallowell, Maine. 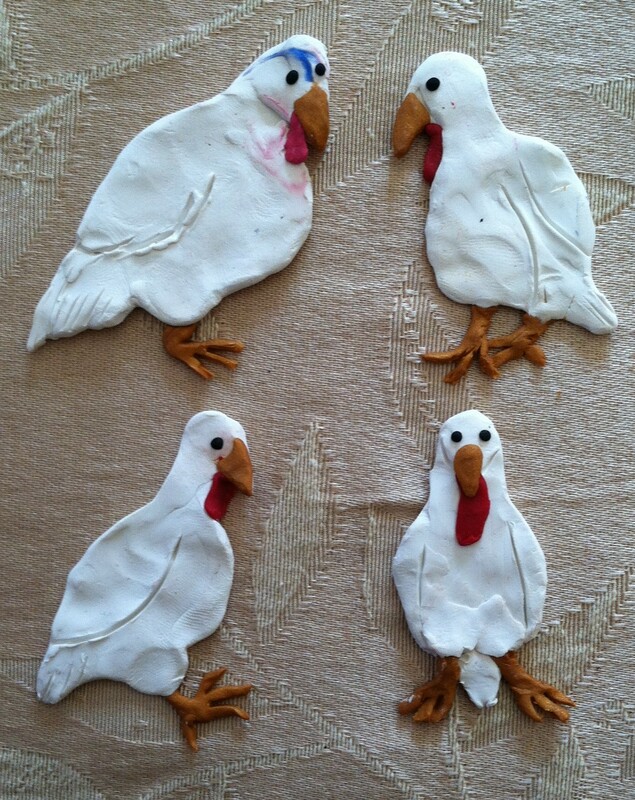 I chose to portray white turkeys (the kind raised for slaughter) rather than wild turkeys (the kind most often [misleadingly] depicted in Thanksgiving-related graphics). I understand the importance of tradition, really I do. I grew up in a house with two religions and two nationalities; a huge part of my upbringing consisted of sharing, understanding, and celebrating different traditions. But I also believe that traditions can, and should, evolve and change based on the development of society and social consciousness. It is not mandatory that a holiday designed to celebrate life, gratitude, and family relationships must have a symbol of death as its very centerpiece. There are other ways to show your appreciation for life’s bounties. Wishing everyone a peaceful and joyful holiday. This month, the folks over at Plant Based on a Budget have offered the challenge of designing 100% plant-based meal plans within a budget of $25 per person per week. Today, I am participating in this challenge by providing a 7-day meal plan that will feed three meals a day to two adults within this budget. For those who don’t know, Plant Based on a Budget is an incredible resource for affordable plant-based eating. Its contributors are working hard to dispel the myth that a vegan diet is expensive and unrealistic for the majority of Americans, particularly those living on a limited income. This is actually a topic about which I feel very strongly. The truth is that a well-designed plant-based diet is not only extremely affordable but also provides outstanding nutrition. Better education and awareness about this could help to address and alleviate the rampant malnutrition in our country’s low-income population. Needless to say, I am thrilled to participate in this challenge. Particularly as most of us prepare for a day or entire weekend of gorging ourselves on an excessive amount of food, it is important to remember that not everyone is as fortunate. As I mentioned, the meal plan outlined below will feed three meals a day to two adults for seven days, and is of course completely plant-based. The total cost of ingredients used to make these meals is $42.25. A breakdown of ingredients by price is included below the seven-day plan. If you would like to see meal plans created by other contributors (including menus for up to 4 people), please visit the Plant Based on a Budget blog. I managed to design this plan without deviating much from my usual style, that is: 1) buying stuff that’s on sale and/or comparison shopping, because like all red-blooded Americans, I like to save money; 2) making frequent (but hopefully not boring!) use of leftovers; and 3) making things that come together fairly quickly on a weeknight and also pack up easily for workday lunches. Baked Marinated Tofu (make this the night before): Drain and press a block of firm or extra-firm tofu, then slice it into strips (8 strips per block). Make the marinade by combining 6 tbsp. low-sodium soy sauce, 1 tbsp. grated fresh ginger, 2 cloves minced garlic, and 1 tsp. sesame oil in a shallow dish. Add tofu strips and marinate in refrigerator for one hour, flipping halfway through. Preheat the oven to 400. Bake tofu strips for 20 minutes, then flip and bake another 10 minutes. You can reserve the marinade to throw into a veggie stir-fry some time next week! 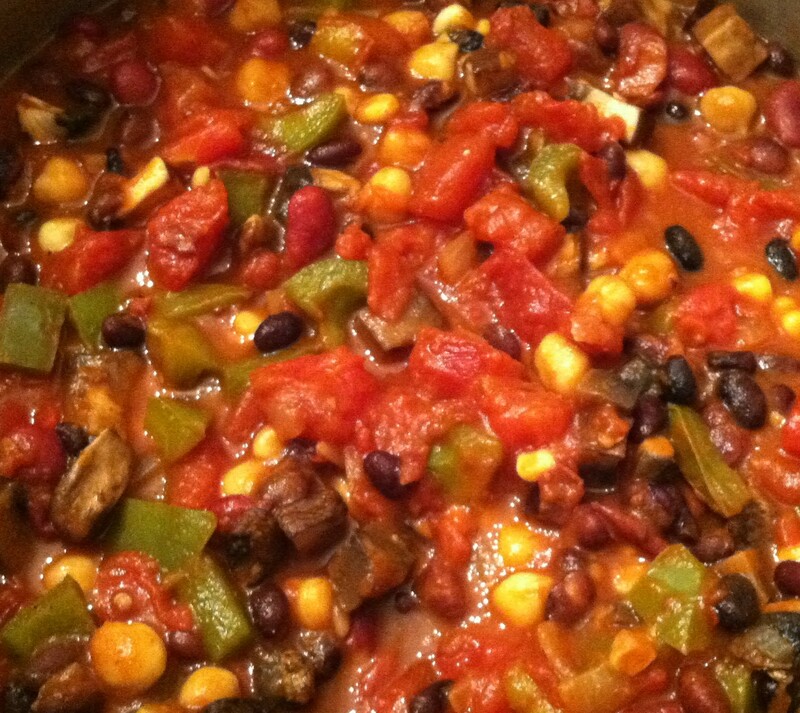 Hearty Chipotle Chili: In a large stockpot, heat 1 tbsp. olive oil, then add 3 cloves minced garlic, 1 diced onion, and 1 diced green bell pepper. Cook 5-7 minutes until softened. Add 4 cans of beans (any variety…this is about 6 cups of beans), 1 cup frozen corn, 1 28-oz. can of diced tomatoes, 1 15-oz. can of tomato sauce, ¼ cup water, and 1 tbsp. finely chopped chipotle in adobo, plus 2 tsp. adobo sauce. Also add ½ tsp. oregano, 1 tsp. chili powder, ½ tsp. cumin, ¼ tsp. cinnamon, ½ tsp. red pepper flakes, and a pinch of freshly ground black pepper. * Stir well to combine, bring mixture just to a boil, then cover and let simmer for about 10 minutes, stirring once or twice. Add 8 oz. sliced baby portabella mushrooms (optional, but I found some on sale for a really good price! ), stir well, then cover pot and cook another 10-15 minutes, until mushrooms have cooked down. Taste for seasoning, top with a tablespoon or two of chopped green onions, and serve with cornbread. Makes approximately 10 cups. The cornbread I used is the Skillet Cornbread from Veganomicon (double-corn variety). Most vegan cornbread recipes will use similar ingredients if you don’t have Veganomicon. *Don’t worry if you don’t have all of the spice ingredients listed in the recipe. The beautiful thing about chili is that it is completely adaptable! You can also omit the chipotle and/or red pepper flakes if heat is not your thing. Easy Lentil Soup: In a large stockpot, heat 1 tbsp. olive oil, then add 6 cloves minced garlic and 1 diced onion and cook until softened, about 5 minutes. Add 2 diced carrots and 2 diced stalks of celery, and cook another 3-4 minutes, until softened. Add 4 cups vegetable broth, 4 cups water, and 2 cups dry brown or green lentils, stir, then cover and bring to a boil. Reduce heat and simmer until lentils are soft and cooked (I find this usually takes 20-25 minutes). Taste and add salt and pepper as needed. Dried thyme and cumin also taste great in this soup, if you have them. 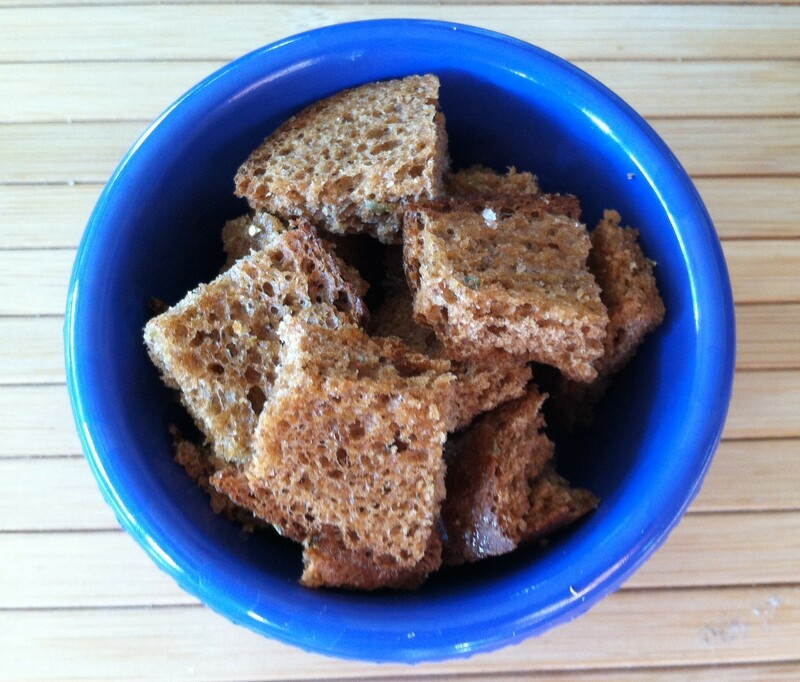 Homemade Whole Wheat Croutons: Take two slices of whole wheat sandwich bread (preferably sort of stale…you can leave them out during the day while at work), brush each side lightly with olive oil, sprinkle with salt and dried oregano, and toast in a toaster or 350 degree oven until crispy and browned. Cut into squares and use to garnish soup or salads. Blueberry Breakfast Cake: This recipe is by Happy Herbivore and can be viewed by clicking here. Easy Baked Potato with Chili: Scrub the skin of the potato (either Russet or Yukon Gold are fine), dry with paper towel, and then pierce several times with a fork. Microwave for 3 minutes. Test with fork. If the fork pierces the skin easily, the potato is done. If not, continue to microwave at 30-second intervals until done. Serve each baked potato with ½ tbsp. Earth Balance, 1 cup of Chipotle Chili, and a tablespoon of chopped green onions. Peanut Passion Soba Noodles: I used Dreena Burton’s recipe for Peanut Passion Sauce (pictured above), which can be viewed by clicking here, and followed her instructions for noodles (in the Notes). Top noodles with a tablespoon or two of chopped green onions, if you like. Southwestern Shepherd’s Pie: Peel and rinse 4 medium-large Russet potatoes (or 6 small-medium Yukon Gold potatoes) and chop them into large pieces. Place them in a large pot, cover with water, and bring to a boil. Once boiling, lower the heat slightly and allow them to gently continue boiling, uncovered, for 10-15 minutes, until fork-tender. Drain the potatoes, then add them back to the warm pot and let them rest for 1 minute to release a little moisture. Transfer the potatoes to a bowl, and add 6 tbsp. soy milk, 4 tbsp. Earth Balance, ¼ tsp. salt, and ¼ tsp. freshly ground black pepper, then mash the potatoes using a potato masher or a fork until smooth. Preheat the oven to 400F. 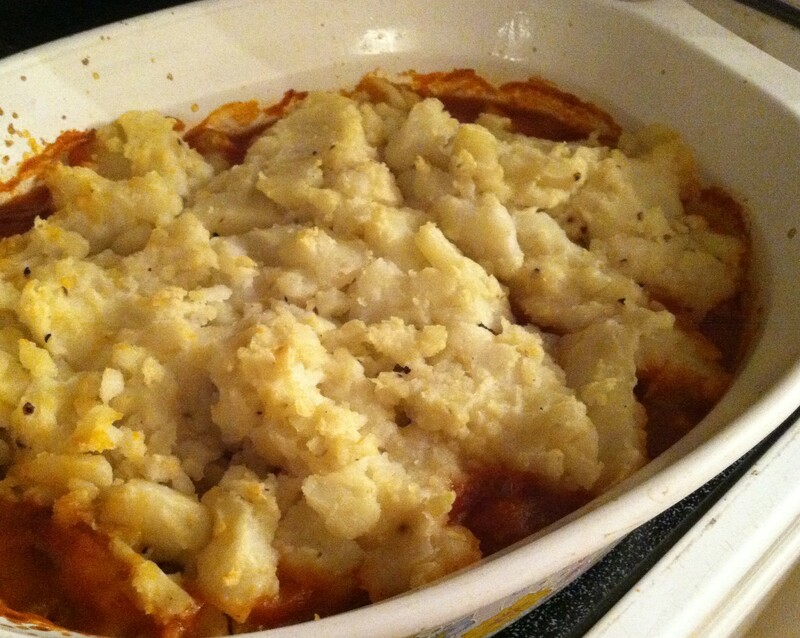 Lightly spray or oil a 9 x 13 glass or casserole dish, then add all of your leftover chili and top with mashed potatoes. Bake uncovered for 25-30 minutes, until potatoes have a golden crust. Remove into bowls, top with a tablespoon of chopped green onions, and enjoy. 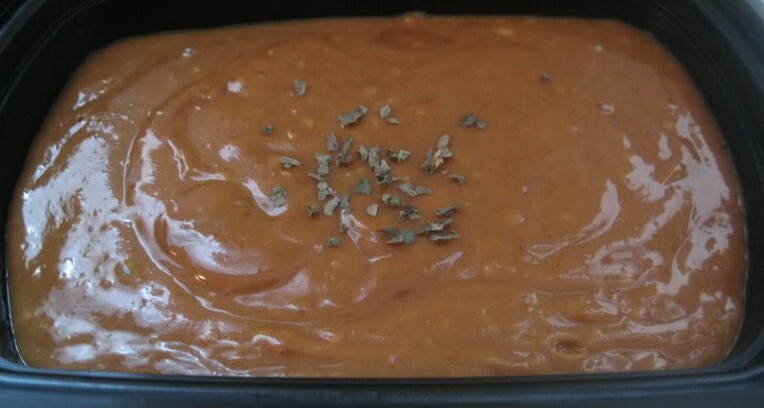 Meaty Lentil Sauce: I made the lentil pasta sauce by following the recipe for Homestyle “Meaty” Tomato Sauce with Lentils and Walnuts from Plant Based On a Budget, but omitting the walnuts. View the recipe by clicking here. Caramelized onion and mushroom brown rice: Cook 1 cup brown rice according to package instructions. Meanwhile, melt 1 tbsp. Earth Balance in a large skillet. Add 1 onion, thinly sliced, plus a generous pinch of salt, and cook, stirring frequently, over medium-high heat until very soft and very brown. Set onions aside and deglaze the pan with a little water (or cooking wine, if you have it), then add 1 clove minced garlic and cook until softened and fragrant. Next, add 4 oz. sliced portabella mushrooms and cook until they soften and shrink down a little. You may need to add splashes of liquid here and there to prevent sticking. Once the mushrooms have cooked, add the caramelized onions back in, plus the cooked rice, and stir to combine. Taste and add salt and pepper as needed. Sautéed tofu: Drain and press tofu and cut block in half, reserving half of it for another time (maybe for that stir fry next week?). Slice the remaining half into triangles, and sprinkle them with a little salt and pepper. In a non-stick skillet, add 1 tsp. of olive oil, then cook the tofu triangles for a few minutes on each side, just until browned. Roasted asparagus: Preheat oven to 400F. Snap off the woody ends of the stalks, wash, and dry them. Place on a baking sheet, drizzle with olive oil, sprinkle with salt and pepper, then place in the oven for 15 minutes, flipping or shaking them about 10 minutes in. I am not a dietician or nutritionist. 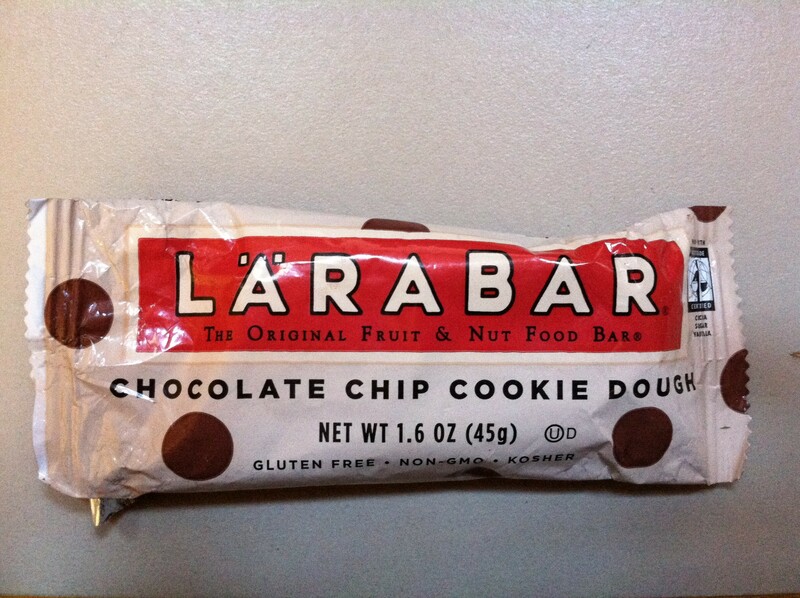 This is just the kind of stuff I like to eat and reflects my personal view of what represents a healthy balance. The only ingredients whose cost is not factored in are things that are commonly found in all kitchens: flour, sugar, baking powder, baking soda, basic spices, and oil. It does not matter what day of the week you count as day one, day two, etc. You will have leftovers!! Leftover lentil pasta sauce, lentil soup, blueberry breakfast cake, whole wheat bread, and canned chipotles can all be frozen. You also can (and should!) freeze the leftover ½ block of tofu. The only things I’m not sure I would freeze are the Peanut Passion noodles and the Southwestern Shepherd’s Pie (can you freeze mashed potatoes? ), so you would want to use any leftovers of those within a few days. Not hard to do because they are so delicious! Please note that I did not actually go out and purchase all of the listed ingredients before coming up with the meal plan. The overwhelming majority of the ingredients used are staples in my kitchen and I already had them available to me. Please feel free to make substitutions or omissions as needed in order to fit the plan into your personal budget or food items you have on hand. The best example of this is the soba noodles; if you don’t have those in your kitchen, but you do have spaghetti or rice noodles, you can save yourself the $3.99 by just using what you already have. Also worth noting is that I did not always pick the cheapest options for all of the listed foods. For example, dried beans are almost always cheaper than canned, but I happened to find canned beans on sale for $.50 each, which I thought was a good deal that would save me time. But the point is that you could save even more money (and avoid sodium, BPA, etc.) by making the chili recipe using beans that you have cooked from dried. Finally, you can probably also find even cheaper options for bread, English muffins, and peanut butter. I felt okay using what I had on hand once I realized that they would fit into the budget for the meal plan. It’s your choice and you should feel free to buy whatever products you like that fit into your budget! 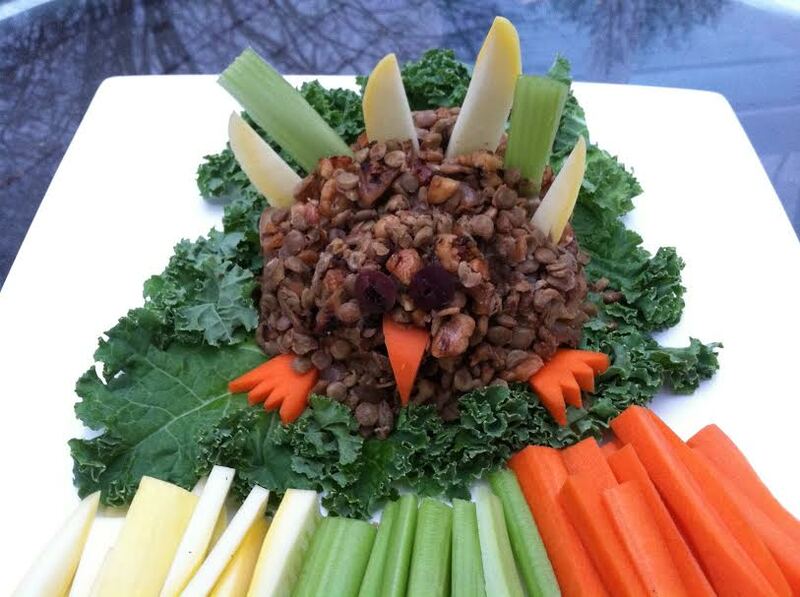 Wishing everyone a happy, healthy Thanksgiving! Sorry but I’m too excited to keep this to myself! Although it’s probably apparent from the fact that I write a food blog, I really find food to be one of the most enjoyable and worthwhile parts of life. Avocado love! Please note that when this was taken, I was 24 and it was still okay for me to do kissy face pictures. Please don’t be too jealous! I will take many photos and will attempt to make them as non-horrible as possible despite the fact that it is currently 4:13 p.m. and pitch dark. Also, I went for a run today but I don’t think that is going to even put a dent in counteracting the amount of food I am about to eat. I’m not even mad. 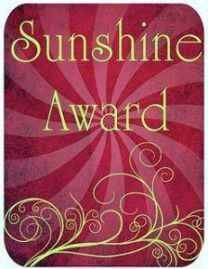 Over the weekend I was honored to receive a Sunshine Blogger Award from Catherine, the blogger behind Veg Charlotte! 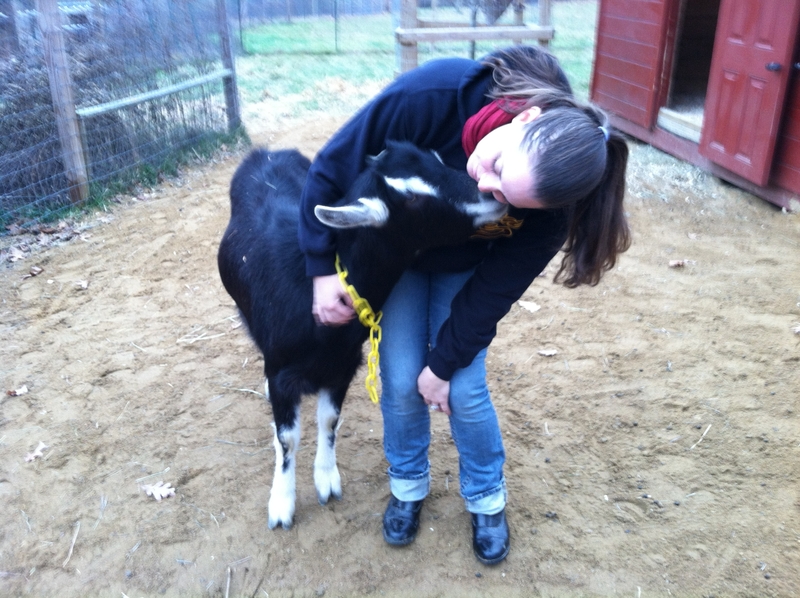 I really enjoy Catherine’s friendly, approachable style and realistic take on what it means to live a vegan lifestyle. 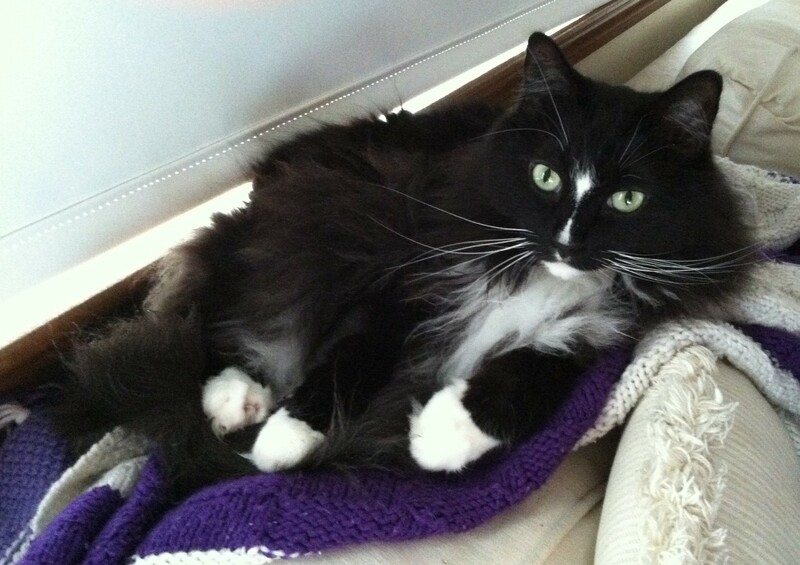 Her Frugal Friday feature is particularly awesome. Definitely check her out if you have a chance. 3. Answer the same 10 questions given. 4. Nominate up to 10 blogs for the award, a link to their blogs in your post, and notify them on their blogs. 1. Where would you most like to travel to? I’ve done a decent amount of traveling outside the U.S. (England, Italy, France, Spain, Portugal, Scotland, Vietnam, Uruguay, Canada, Israel, Palestine [the West Bank], Ireland, Panama) but there are still many places I want to visit! So the answer to this question is that it’s a toss-up between India, Thailand, and Peru. Oh also, Turkey and Egypt. Yeah I can’t pick just one. 2. Do you have a sweet tooth? Yes!! Although it has waned a little in recent months, meaning that while I still LOVE sweet treats, I no longer have the need to have one every day. Not sure why but I’ll take it. 3. What motivates you to keep you blogging? Blogging is the creative counterpart to my professional life as a lawyer, where my writing is necessarily dry and technical. From the cooking, photography, and writing to reading other blogs and interacting with wonderful people all over the world, motivation is easy to come by! Male: Andy Samberg; female: Amy Poehler. Horseback riding! I spent a heavy portion of my middle school and high school years riding, training, grooming, and working with horses plus teaching lessons and working at riding summer camps. I kept riding through college but after that I wasn’t able to keep it up because of work and financial constraints. But it’s still the best thing I can think of to do outside. I like running too but it doesn’t compare. 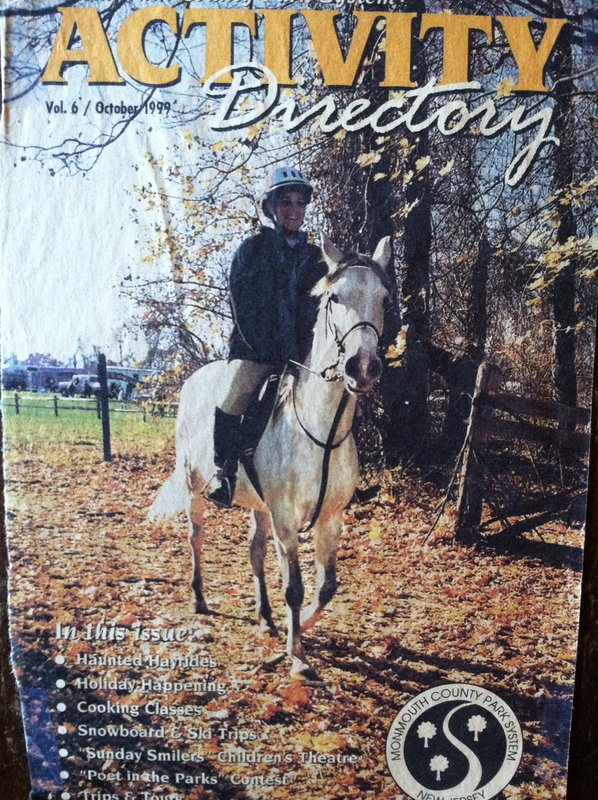 This is me at age 15, riding my horse Penny in our county hunter pace. Cover girls! This is a tie between my two high school Spanish teachers, Sras. Barca and Vodhanel. It has to be a tie because one of the great things about them was how these two petite ladies complemented each other. 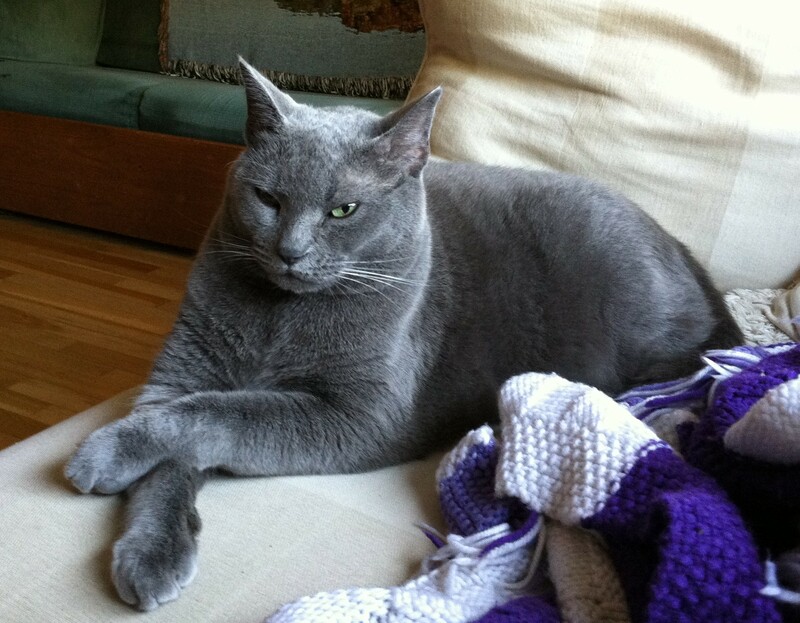 Barca was dark-haired with a sassy wit while Vodhanel was fair with a soft voice and gentle manner. They were great teachers, plus I was really good at Spanish so I did well in their classes (I think that always helps). They were also my advisors in Spanish Honor Society and were just really good at coming up with awesome trips and fun outings for us (like going into NYC to see a play in Spanish). 7. Do you own any pets? Once in high school, I went to sit down at a table in the upper library and ended up crashing to the floor among shards of broken chair. I think the chair must have already been broken before I sat down, but I still felt like a heiffer and everyone was laughing so all I could do was laugh along. It sucked though and it kinda hurt too! 10. How much wood could a wood chuck chuck if a wood chuck could chuck wood? Thanks for reading if you’ve gotten this far! And thanks again to Catherine for the nomination!! I am happy to report that all three of the vegan options I brought to my work party last night WERE SUCCESS! Yep, that is the lonely remaining cookie from the smorgasbord. No one ever wants to be the person to take the last one! So he’s mine, all mine. As I said, all three of the selections were very well-received. Lots of folks commented on the perfect texture of the cookies and asked for the recipe. People also seemed to really like the spinach-artichoke dip, and I got quite a few questions about it. This was probably largely due to the fact that I put a sign on the bowl cautioning that it was nut-based, because to the naked omnivore eye, it looks just like a “normal” dairy-based spinach-artichoke dip, and I was worried that someone with a tree nut allergy would assume the dip was safe and be in for a very unpleasant surprise. My lawyerly wheels are always turning, I tell you. What are some other fail-proof dishes for bringing to omnivore gatherings? Have a wonderful weekend! Last one before Thanksgiving!!! Hello friends! 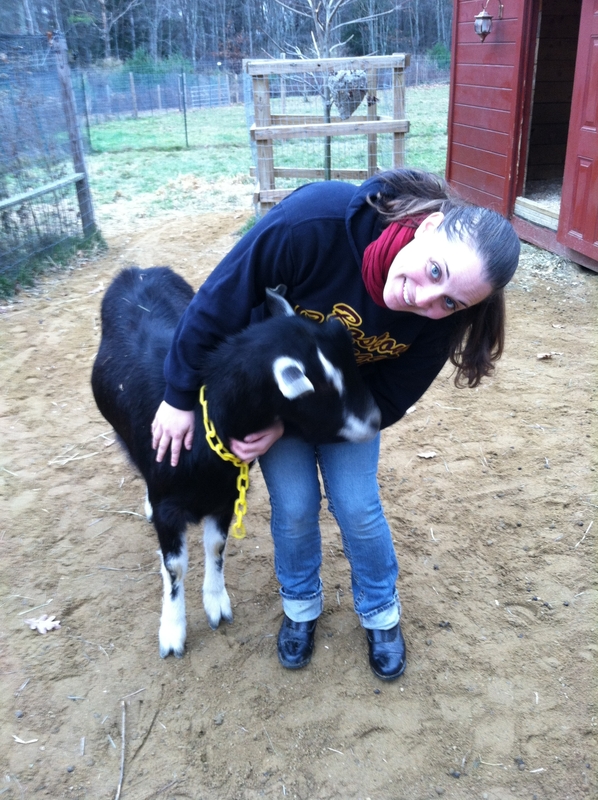 So even though I am still basking in the awesomeness of Virtual Vegan Potluck, I figured it was time to post again so I can share a little bit about the day that H and I had at the animal sanctuary. But first of all…seriously, how awesome was VVP?! I lost count of the number of new-to-me blogs I discovered and incredible recipes I bookmarked. Huge props to Annie of An Unrefined Vegan for coming up with such a fantastic idea, and for being willing to put in the immense amount of work it takes to organize it. 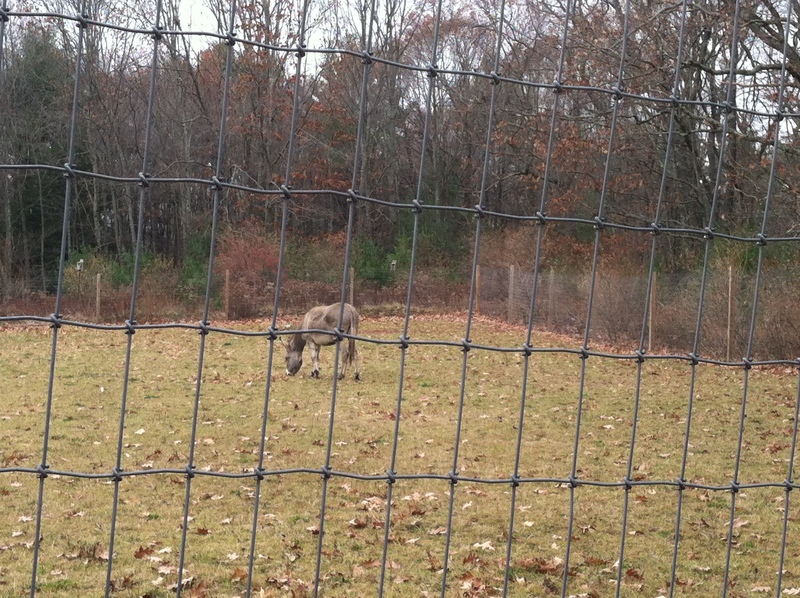 Anyway, as I mentioned last week, the day after the Virtual Potluck, H and I went to a real-life potluck at Sunny Meadow Sanctuary in central Massachusetts. Before the potluck though, we spent several hours working around the farm. 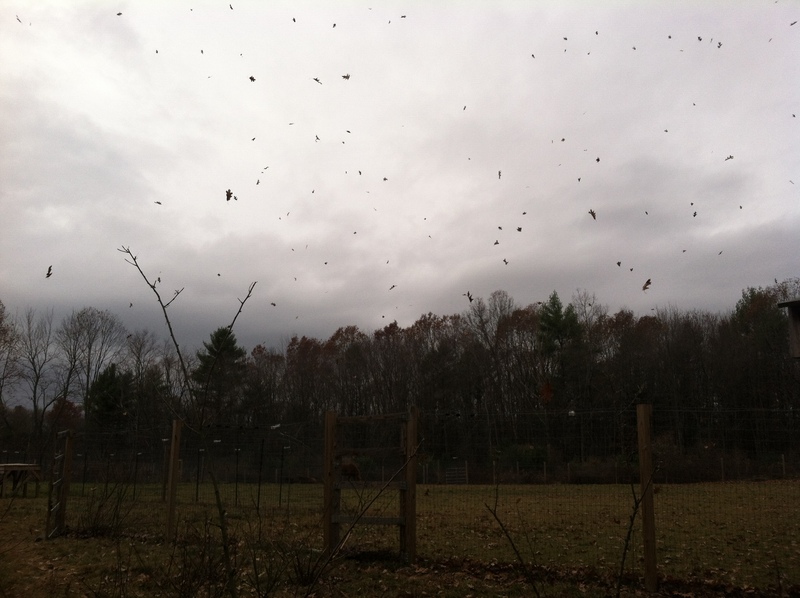 It was a grey fall day, a little chilly but not terribly cold, with a few spots of rain. I was bundled up to begin with, but quickly shed layers as we began working hard! First, we cleaned out the goat barn, removing all of the soiled bedding and hay, sweeping, and replacing it with fresh shavings. 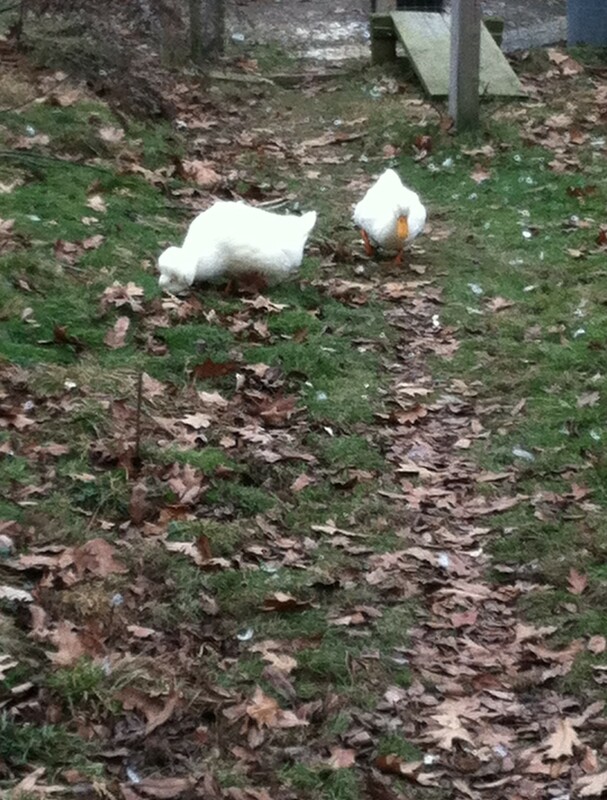 This required several trips across the farm to empty our wheelbarrows on the manure pile. 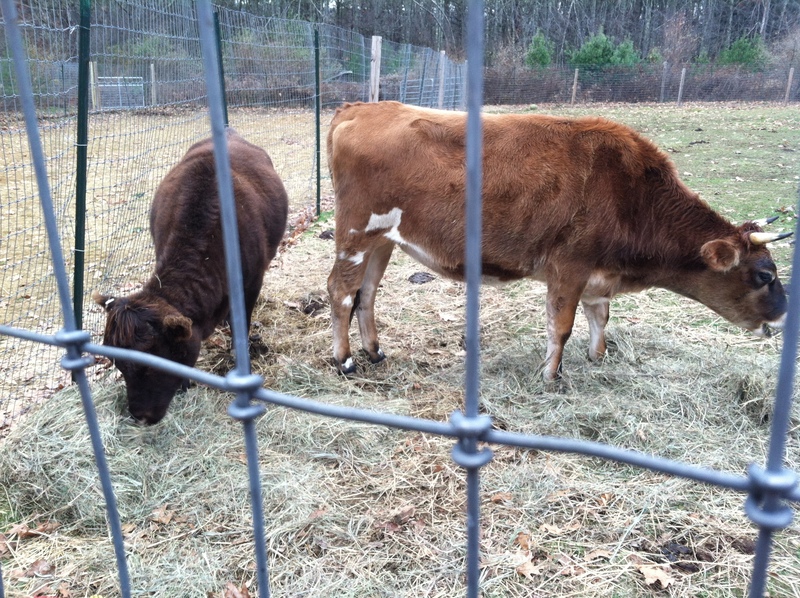 Afterwards, we visited the pigs and helped to clean up their pasture area. 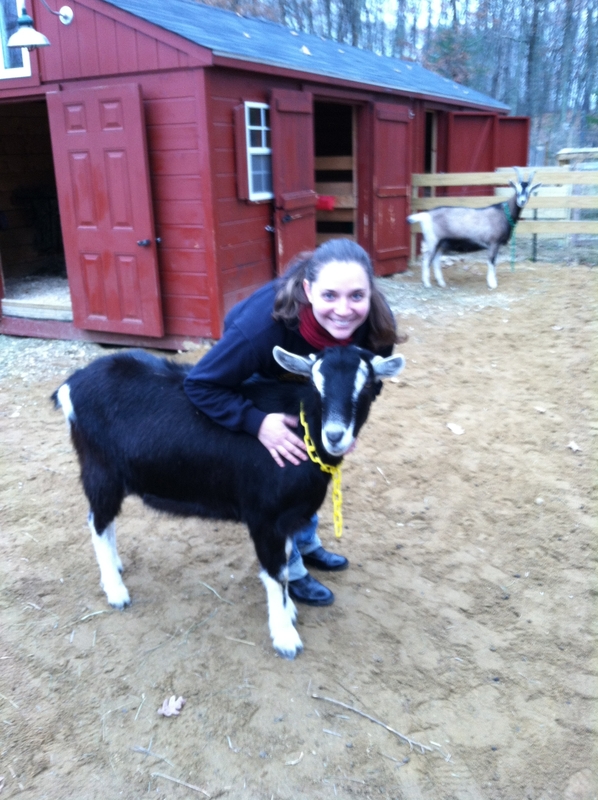 And then, I got to play with goats!!! Anyway once darkness had fallen and the work was done, it was time to feast! 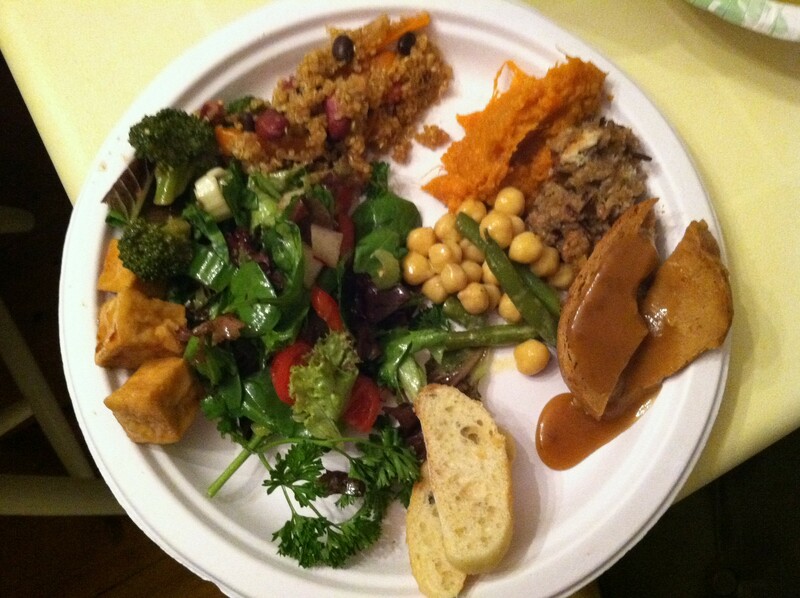 My plate included a big helping of a delicious salad made with lots of fresh parsley, marinated tofu cubes from Whole Foods cold bar, an absolutely incredible quinoa and bean salad, mashed spiced sweet potatoes (from a Veganomicon recipe, I’m told), a two-bean salad (chickpeas and green beans), Tofurkey roast with wild rice stuffing and gravy, and toasted baguette slices. 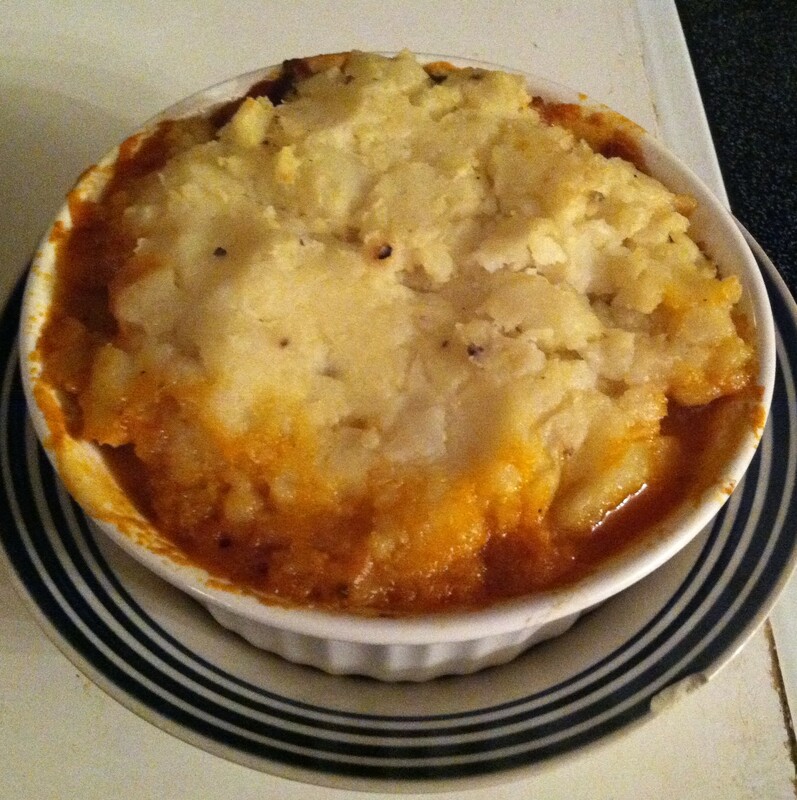 I had seconds and thirds of the mashed sweet potatoes…they were incredible! Overall it was just a really nice day, and a great chance to meet some big-hearted people trying to do some good for the animals. So now I have officially kicked off the season of cooking stuff to share with other people. It’s important to me that I share really high-quality, well-prepared vegan food when serving to an omnivore crowd. This Thursday night is my work holiday party (super-early, I know!) and because I feel confident that there will be nothing vegan to eat, I am going to make at least two appetizers and at least one (but more likely two) dessert to bring along. 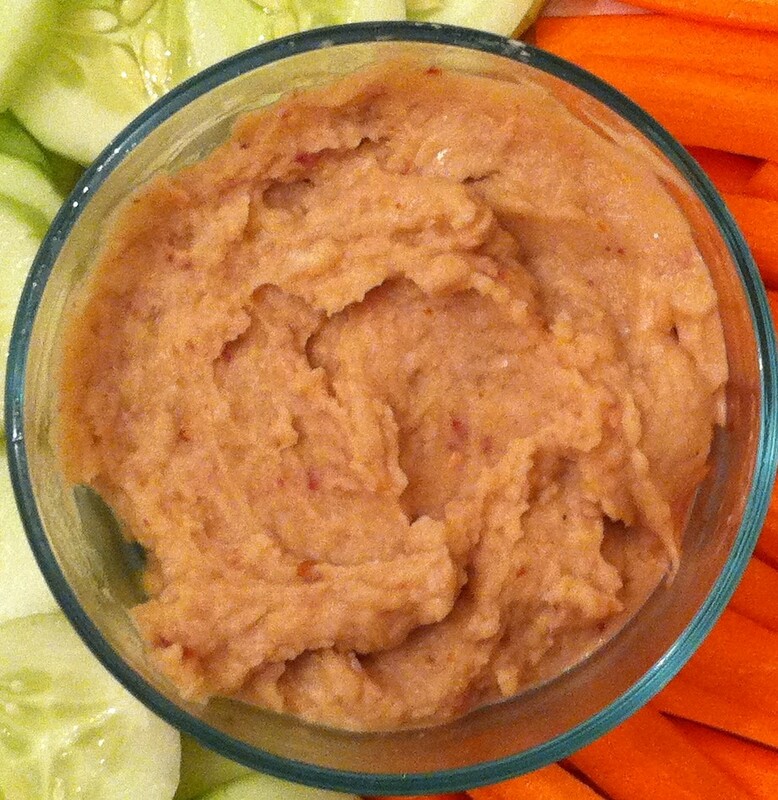 The first appetizer I’m going to make is this super-simple Chipotle White Bean Dip using as a base the recipe from the Plant Based on a Budget blog, which I like to tweak by adding additional spices and lime juice. Click here to see the original recipe. 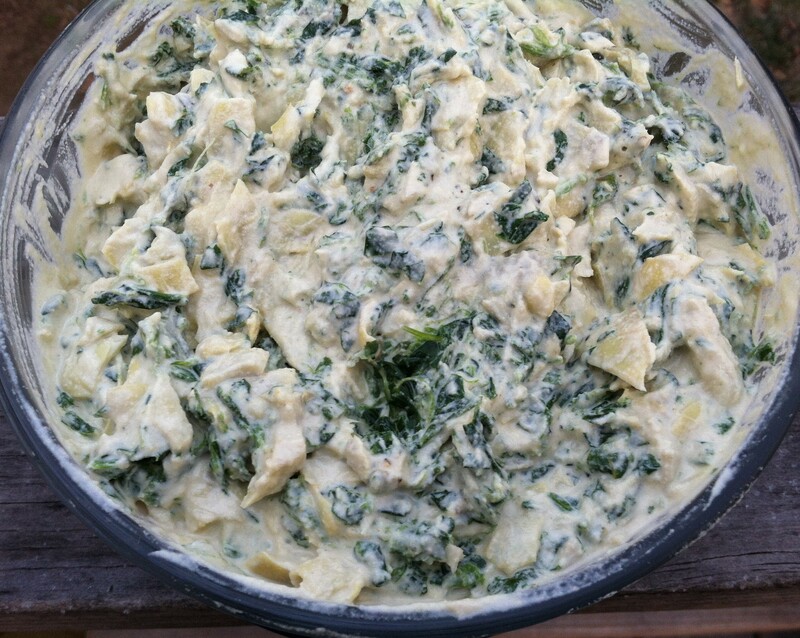 The other is going to be the Spinach Artichoke Dip with Garlic Cashew Cream that Glue and Glitter shared in the Virtual Vegan Potluck (click for recipe). And for dessert, I have options, options, options! 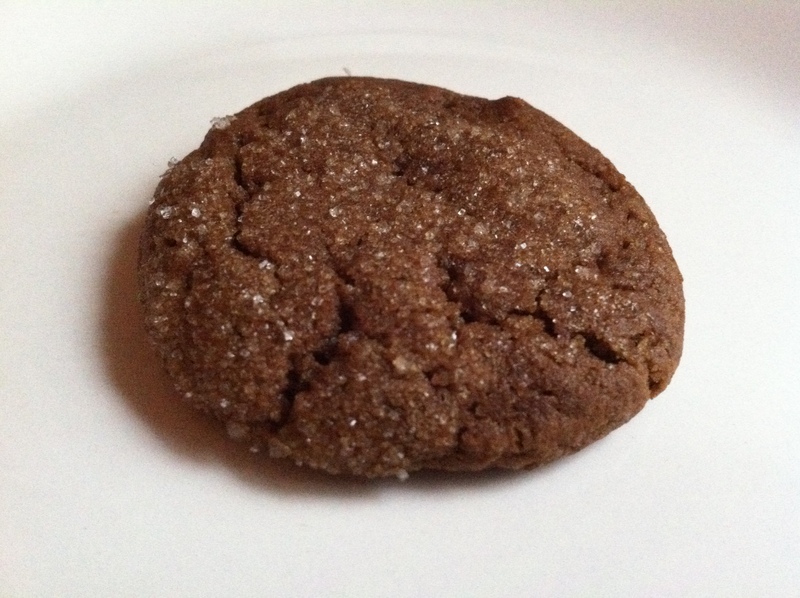 The one that’s jumping out the most at the moment is Chloe Coscarelli’s Chewy Ginger-Molasses Cookies (click for recipe), but I’m also weighing some peanut butter and chocolate concoctions, because those always seem to go over well. AND I have to make a decision ASAP about what to bring to Thanksgiving dinner next week, both for sharing with omnis and for my own dinner. Same deal with Christmas dinner a few weeks later! Finally, I just found out today that there is a Thanksgiving themed vegan potluck coming up this weekend, followed by a tour of another animal sanctuary, Maple Farm Sanctuary in Mendon, Massachusetts. Not sure if I’m going to be able to get to that one but man does it sound fun. I am so excited to be participating in the VVP today, and am bringing an appetizer to share. Not just any appetizer, but a beautiful perfect-for-fall Beet ‘n’ Bella Carpaccio! Beets are the featured ingredient for this installment of the VVP, and since I absolutely love them I decided I’d commit to using them in my appetizer creation. I’m so glad I did! This appetizer (it’s sort of a salad too, I suppose) is served cold. Enjoy the earthy flavors melded with the tanginess of the lemon juice, sweet acidity of the balsamic vinegar, fresh bitter bite of the arugula, and creamy crunch of toasted pinenuts. Make the marinade by combining the balsamic vinegar, olive oil, tamari, lemon juice, lemon zest, oregano, and rosemary in a small bowl. 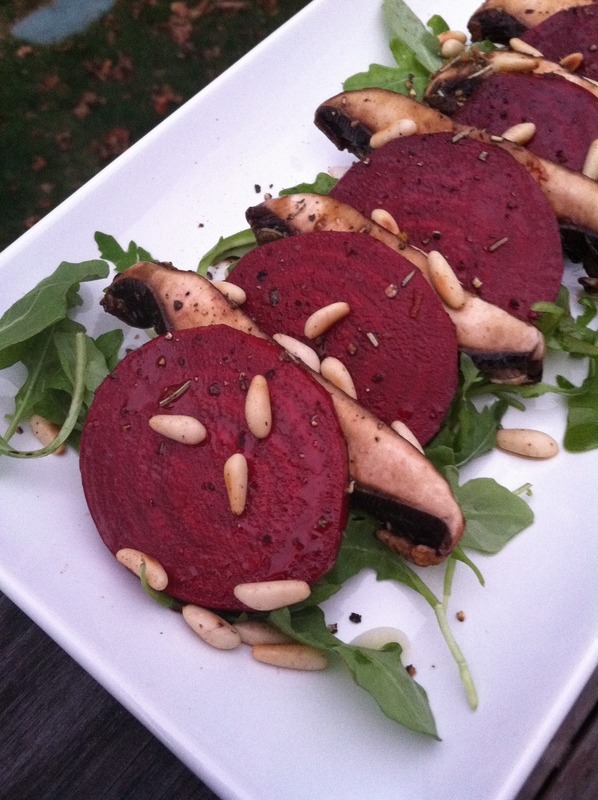 Place beet slices in a shallow dish and mushroom slices in another shallow dish. Divide marinade over both dishes and swirl around a little, making sure the beets and mushrooms are mostly covered. Let marinate in the fridge for 20 minutes, flipping halfway through. While the beets and mushrooms marinate, wash and dry the arugula, then prepare your plate by adding a thin drizzle of olive oil (I used a garlic-infused variety) and then laying the arugula over it. When the beets and mushrooms have finished marinating, remove the individual slices, shake off the marinade a little, and then lay them one by one on your serving plate, alternating beets and mushrooms. Garnish with pine nuts, salt, and pepper. Serve chilled. Recipe Note: When prepared according to this recipe, the beets remain pretty crunchy. If you would like them to be more tender, simply increase their marinating time, which will give the acids in the vinegar and lemon juice a chance to break them down more. I’d guess you could leave them in the marinade as long as overnight. I wouldn’t leave the mushrooms in for more than an hour, though. 1) Try subbing orange juice and zest for the lemon. 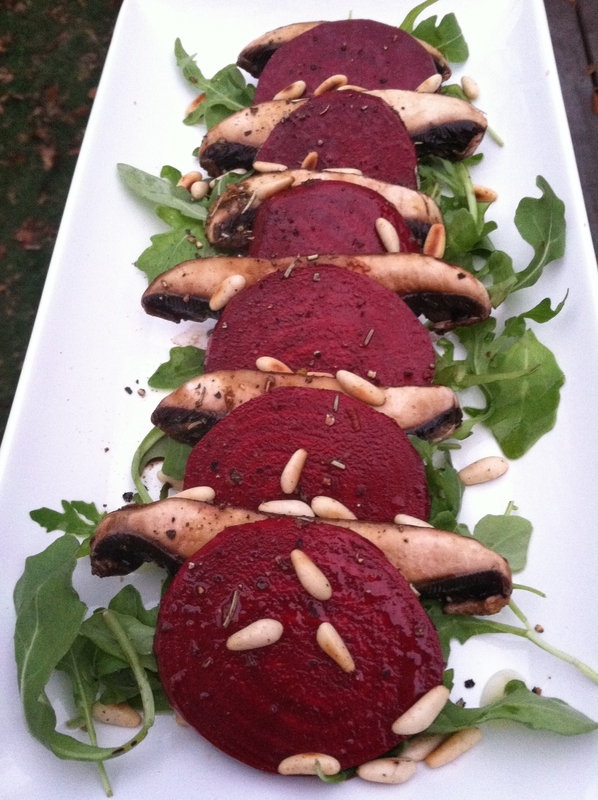 2) Try grilling the beets and mushrooms before plating. Or click here to start at the very beginning of the potluck!